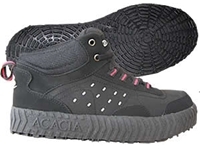 Acacia® Grip-Inator Broomball Shoes Acacia® "Grip-Inator"
Traditionally classed as an outdoor shoe by conventional sole design but its been confirmed to be an excellent choice for both indoor and outdoor conditions. After a couple weeks of testing, the shoe appears to be a real WINNER! 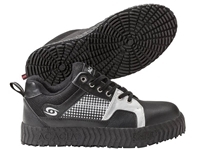 The sole is very durable as it has an elastic "rubber band like rubber" compared to what we would call the "foam rubber" D-Gel and Acacia's other model shoes currently have. The only thing we disliked was that the laces are WAY TO LONG on some sizes. Made in China. 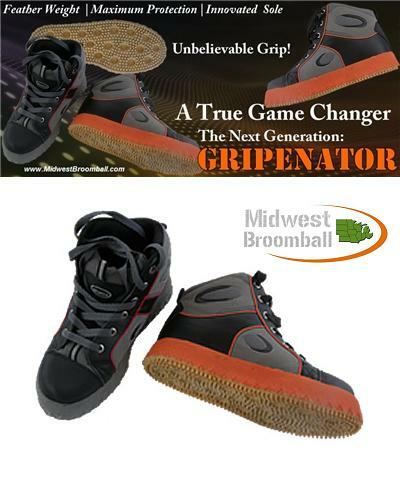 Save $2.00 on Orange soles! It takes a little bit to break in, but they hold up pretty good for me. I like that they have a higher ankle. I hate the Laces, but that is easily remedied. I have owned 2 pairs of these. I got 2 tournaments and 4 sessions out of my first pair. (I did play two of those sessions in goal, so it does prolong the wear). 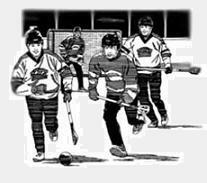 In Maryland, we only play indoor, but I have used them on clean ice, and rough ice. They are like glue on rough ice, non-zambonied. Works well both indoors and outdoors. Would recommend to anyone! These shoes were bought last year and worked well when first used. 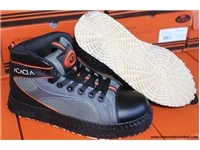 After a few uses they bottoms began to dry out and crumble, unlike other models and brands of shoes we have. This season when the shoes were taken out, the shoes were stuck to the inside of the bag as if they had melted too it. Thought it may have been just a bad set, but going to our first game this year another person had the same pair and they had deteriorated at the same rate. In my opinion the Acacia Trio Pro can save a couple bucks and are well worth the investment.